After getting stunned at home through the first two games, the Texas Rangers will try to change the dynamic of their ALDS with the Toronto Blue Jays, heading to Canada trailing 0-2. WHile the second game in the series wasn’t as one-sided as the first one, it had similar moments: One big inning by the Blue Jays doing enough to leave the Rangers shellshocked, and incapable of coming back to really put pressure on Toronto, who leaned on excellent bullpen in the end instead of wonderful rotation pitching. 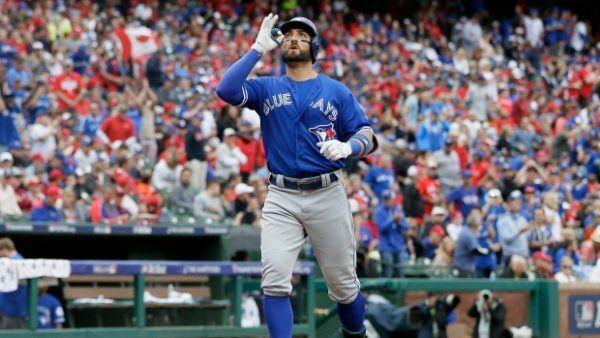 Previous game: The Blue Jays won 5-3 to take 2-0 lead, mostly based on three home runs in the 5th inning, all off of Yu Darvish: Kevin Pillar, Ezequiel Carrera and Edwin Encarnación, while Troy Tulowitzki hit a two-run homer to open the game in the second inning. The Rangers scored twice in the 8th, but Roberto Osuna came on to get five outs and was terrific, striking out 2 and allowing just one hit. Starting pitchers: Colby Lewis takes the mound for the Rangers, hoping to do better than Darvish and Cole Hamels. The 37-year old pitched only 116 innings this season, posting a 3.71 ERA. His WHIP was good, but it’s getting harder and harder for him to strike batters out. He played in two games vs the Blue Jays this season, giving up five runs in 14 innings of work, one win and one loss. Jose Bautista has two home runs against him in 17 at bats. For the Blue Jays, it’ll be Aaron Sanchez, who might be the Blue Jays best pitcher, despite what we saw from Marco Estrada in game 1. Sanchez made the All-Star game this season, finishing with an AL best 3.00 ERA, and giving up less hits per nine innings than anyone, only 0.7. The 24 year old pitched twice against the Rangers back in May, which included giving up six runs in 6.2 innings the second time. He has given up a home run to Carlos Beltran and Adrian Beltre among the Rangers lineup. Hot bats: The Blue Jays have Josh Donaldson with a six hits, batting .462 so far in the postseason, and also Troy Tulowitzki, batting .385, with 5 hits and 5 RBIs through 3 games. Elvis Andrus is probably the only one standing out for the Rangers at the moment, batting .429 with 3 hits in two appearances, but not a single RBI.